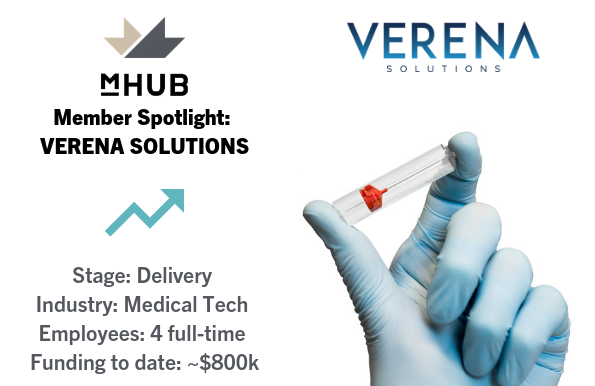 Verena Solutions, mHUB member since opening day in 2017, is the manufacturer of SimpleCap, a dental needle solution that provides safety, ease of use, and comfort to both patient and dental practitioner. Verena’s startup journey began nearly 6 years ago in the garage of founder and president, Michael Infanger. Today, the company has developed numerous prototypes, received about $800,000 in funding, and is finalizing automation for the manufacturing process. Where did your idea and value proposition start? Verena Solutions was born out of a shared frustration among dentists and patients. Many dental products used, particularly dental needles, are cumbersome, prone to misuse, and potentially dangerous on both sides of the dental chair. Dentists are doing multiple injections to patients with the same needle, which doesn’t happen in medical. With more than 110,000 individual offices, the dental market is 20 years behind in moving towards group practice. This makes it difficult to deploy a widespread change. After 5 years as an engineer, I decided to build a business around a new standard of care. I set out to create a system easier and faster to use and less frustrating for everybody involved – all within the same workflow and procedures that dentists currently use. What lead you to mHUB? After growing out of the 3D printer in my garage, I began looking into community spaces that focused on physical product development. I found Catalyze Chicago, mHUB’s predecessor, and it has been extremely valuable in helping us continue the prototyping process. How has your business grown? We have become power users of the prototyping labs provided by mHUB including machines - from 3D printers and Computer Numerical Control (CNC) machines, to laser cutters - and staff expertise to develop the components and assembly process of SimpleCap, which we currently produce manually. Each new version of the product has opened the door to new investors and clients. We’ve gotten to the point now where we are working to automate manufacturing, which will allow us to produce 2.5 to 3 million parts a year compared to just 80,000 annually. We’ve also taken advantage of mHUB’s Product Engineering Services (PES), which connects us to manufacturers to do contract work. Through contract work, we’ve been successful in bringing in about $500,000 a year, which has been an incredible help in funding R&D and production of SimpleCap. The extra revenue gives us the runway to invest back into our business. What’s next for Verena Solutions? Once we’ve automated our manufacturing process, we’ll be able to not only meet the demand we’ve seen – but scale at an incredible rate. We’re currently 6-weeks back-ordered for the product with virtually no marketing, so finalizing this process will have an incredible impact on our business.